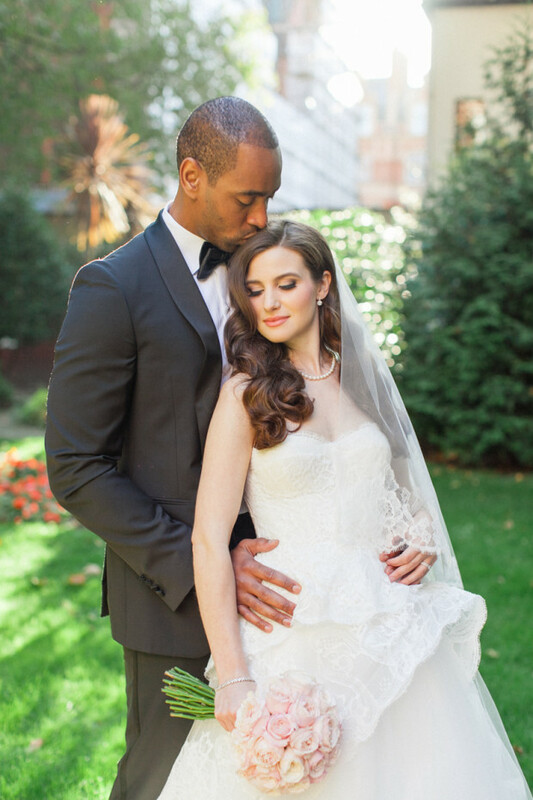 Ashley and Chiri were a completely adorable couple with an international background. They met whilst living on different continents but now live in Vancouver, Canada. Chiri’s British/Nigerian family live in the UK, while Ashley’s relatives live across Canada and the USA. Although they’ve been together for many years, as you can imagine, many of their family members, including their parents, have never met before. So, to give everyone time and space to get to know one another without the distractions of extended family members and friends, Ashley and Chiri planned a wonderfully intimate ceremony and reception – a fine art wedding photographer’s dream! I have to say that Ashley looked absolutely amazing. Her Monique Lhuillier gown and shoes were so incredibly beautiful and her ethereal veil, with its delightful lace edging was divine. I also adored her delicate and timeless jewellery not to mention her pretty rose bouquet from Wild at Heart. Following the bridal preparations, we adjourned to a small park near the hotel for their first look photos and also their couple session and wedding portraits. I love using natural light in my photography so this was heaven for me but what I’ll always remember about this day is how deeply in love Ashley and Chiri were. Chiri is a true gentleman, perfect for my editorial wedding photography and I hope I really captured their romantic spirit. The ceremony was so special. Ashley and Chiri wrote their own vows and all of their guests were involved in a unity candle lighting ceremony. As a couple, they wanted nothing more than to involve those closest to them in their wedding and create a celebration that was truly theirs. They absolutely achieved this and I was honoured to be Cat’s second shooter and their second London wedding photographer. I love to photograph London weddings and as a London wedding photographer, I know the capital inside out. I’d love to help you as you plan your wedding in London and I’d be thrilled to be your wedding photographer. For more information on my London wedding photography, do take a look at my wedding photography website. If you’re marrying overseas, you’ll also find my destination wedding photography services here too. You’ll often find me photographing weddings in Italy and in Greece. You can take a look at my wedding photography gallery right here. I’ll be back very soon but, In the meantime, why not keep in touch on Facebook, Twitter, Instagram, Pinterest or Google+? Or get in touch with me here. Finally, don’t forget my Facebook group for couples marrying in Italy – come and say hello!